Metro announced this afternoon that the repairs of track circuits between Fort Totten and Takoma Park have been completed, ending the last of the emergency maintenance after the crash this summer. This means that trains will be permitted to operate at their usual speeds through the area, and not under the degraded speed that they have been using during the repairs. It’s not immediately clear if this will permit a return to Automatic Train Operation mode, which would return the Red Line to full speed, but we’ve asked Metro to clarify the situation. 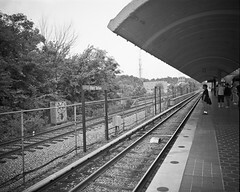 Metro will still be working at Fort Totten and Takoma Park on the weekends, however, as part of regularly scheduled maintenance, and trains will single-track through that area in the late evenings. With the longer delays between trains in the late evening, though, additional delays are unlikely. Update: ATO is still off-limits until the NTSB Report comes back, which would give a conclusive ruling as to what caused the accident. WMATA has never listened to NTSB before, why start now?